When Susan Spencer-Wendel, a retired writer for The Palm Beach Post and best-selling author, was diagnosed with Amyotrophic Lateral Sclerosis (ALS) or Lou Gehrig’s Disease — a debilitating and eventually fatal condition that aggressively attacks the neurons controlling voluntary and involuntary muscle groups — she was determined to continue writing as much as possible. So determined, in fact, that even after losing her mobility, Spencer-Wendel, 46, was still able to complete an entire 357-page memoir about her life with ALS using only her right thumb and an iPhone. The memoir she authored during this painstaking process, Until I Say Goodbye: My Year of Living with Joy, went on to become a national bestseller, the story of her struggles and triumphs motivating readers all over the world. But soon, ALS threatened to make Spencer-Wendel a prisoner in her own body. When the accomplished author could no longer move even her thumb, taking away her physical ability to write using a keyboard of any kind. Discouraged, Spencer-Wendel nearly gave up on writing — and life — altogether. Realizing how incredibly isolated she felt because of her disease, Spencer-Wendel asked her 15-year-old daughter Marina to do her a favor — find her a furry friend with oodles of personality. Sure, the family already had a 55-pound Hound mix named Gracie, but Spencer-Wendel wanted a small dog that could sit with her, a buddy to call her own as she came to grips with her condition. 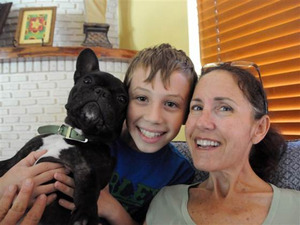 And that’s how Lenny, the 18-pound black-and-white French Bulldog Spencer-Wendel calls her confidant and her “foil,” came into the author’s life. Before Lenny, Spencer-Wendel felt trapped, stifled, without an outlet for her thoughts or her creativity. But with loyal Lenny by her side, Spencer-Wendel says she found the inspiration she needed to continue her craft. Using a gadget called the HeadMouse Extreme, a writing system for people with mobility issues that uses a reflective sensor dot placed on the nose of the user to control a cursor on a computer screen, Spencer-Wendel is back to doing what she loves — writing. The process is meticulous, challenging even, but in the end quite rewarding for the author. Without Lenny’s encouragement, Spencer-Wendel may never have tried the new writing system at all — and she definitely wouldn’t have been able to write her newest essay, published on TODAY.com on August 1. In “My Furry Foil,” Spencer-Wendel tells the story of how she’s coping after losing control of much of her body, and how Lenny’s love gets her through even the toughest days. At its heart, Spencer-Wendel’s piece is about how one little dog showed her she didn’t have to let her setbacks stop her from living — which for the author, means writing, too. “He is pinning down my right thumb, the one I typed my book with, reminding me I have to move on, learn to type another way,” Spencer-Wendel writes of her fabulous Frenchie. To read Susan Spencer-Wendel’s essay in its entirety, check it out on TODAY.com.